ECM's pioneering Officium, which mixed the classical Hilliard Ensemble and jazz saxophonist Jan Garbarek, made a welcome guest appearance here recently. Officium was recorded in the 16th century monastery of St. Gerold in Austria, and writing about it prompted me to listen again to two jazz/classical fusion discs recorded in another historic building. The Castel del Monte is a 13th century castle built by the Holy Roman Emperor Frederick II in the Apulia region of southeast Italy. The castle, seen in my header image, is remarkable for its symmetrical design which is informed by the number eight. 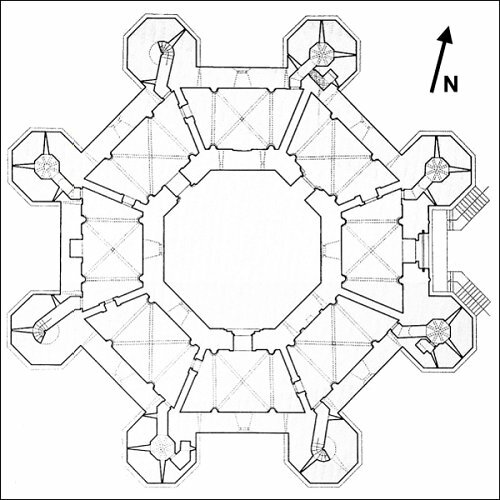 Each floor has eight rooms and there is an eight-sided centre courtyard, and, as seen below, the ground plan of the fortress is an octagonal prism with an octagonal bastion at each corner. French tubaist and serpent player Michel Godard trained as a classical musician and has worked with many leading orchestras, but he is best known as a progressive jazz musician*. 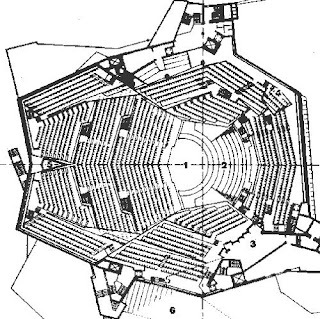 He was attracted to the ambience of the Castel del Monte and in particular the building's unique acoustics. Clearly the castle was not designed as a recording studio, but there is a scientific explanation as to why it makes such a good recording venue. Parallel surfaces and the standing waves they cause are the enemy of good acoustics. 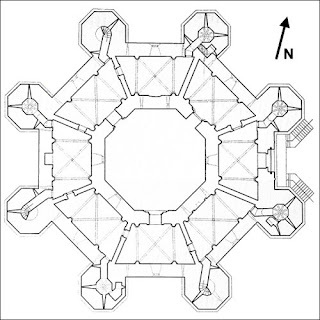 Although the plan of the Castel del Monte is strictly symmetrical the eight walls in each octagonal space minimise parallel surfaces and encourage random reverberation. 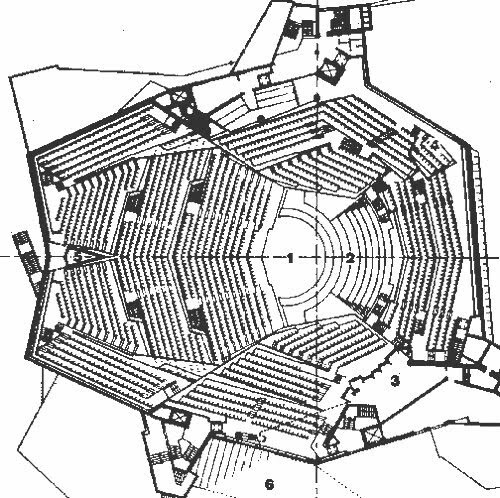 To see what I mean compare the groundplan of the 13th century castle above with that of the acoustically excellent 1965 Berlin Philharmonie Hall (architect Hans Scharoun) below. 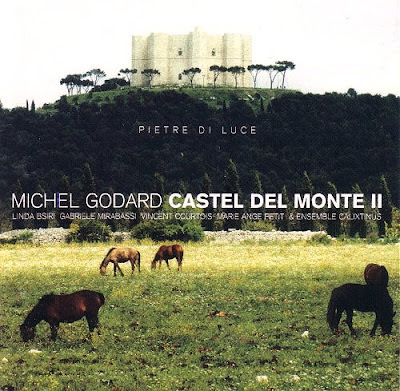 The result of Michel Godard's obsession with Castel del Monte was two albums recorded in 2000 and 2002 in that unique venue for Enja Records. This maverick German label is a near neighbour and almost exact contemporary of the much better known ECM in Munich, and some artists have recorded for both labels. 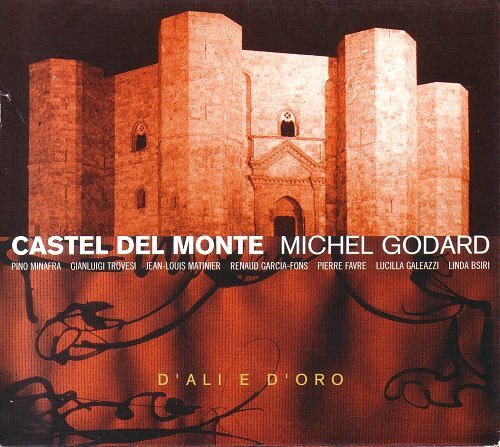 Michel Godard's first Castel del Monte CD for Enja, seen in my header image, has subtle Arabic undertones and uses eight musicians, but not, alas, cutting eight tracks of eight minutes length. The second release seen below is more plainsong influenced and increases the complement of musicians by additional vocalists to an unsymmetrical thirteen, but compensates by offering sixteen tracks. Much of the recording for the two CDs was done in the open-roofed octagonal central courtyard with some tracks using smaller ensembles recorded in the ante rooms off the main courtyard. The mystical symmetry of the Castel del Monte (which supposedly is the model for the old fortress in Umberto Eco's novel The Name of the Rose) undoubtedly adds something special to the sound of the discs while the music, which blends folk, contemporary, medieval and free jazz influences, is also pretty special. Well worth exploring if you want to take the path beyond Officium. * Michel Godard played on Alpha Blondy's 1987 album Revolution. We came to know Alpha Blondy's music from our visits to France and Morocco - he is hugely popular in both countries. Born Seydou Koné in Dimbokro, Ivory Coast, Alpha Blondy has been dubbed the Bob Marley of Africa and he has recorded with The Wailers. His songs carry strong political messages, he has been an activist for a variety of causes and in 2005 was appointed United Nations Ambassador of Peace for the Ivory Coast. He coined the French term democrature (English translation 'democratatorship') to identify some African governments. Serial music as architecture here and the art of activism here. My favorite albums by my favorite musician. Thank you for this post.